Transportation, agriculture, and companionship—Humans are significantly affected by interactions with animals. Our modern lifestyles would not be possible without the domestication of animals. When did humans start to have pets? Why did pets and other domestic animals begin to matter? How were they used? These are questions that archaeologists ask themselves and have done their best to answer. desired traits, causing dramatic changes in the physical structure of animals. Different societies selected for different characteristics, including fur color, ability, and shape. The same qualities are found in cat remains, though cats are estimated to be domesticated around 7500 B.C. While most would like to hear more about the exciting shift of our furry friends from wild hunter to companion, the most striking information regarding the domestication of animals is looking at farm domestication and how groups of people shifted from nomadic bands to pastoral, sedentary groups. The first animals thought to be domesticated for agricultural endeavors were sheep between 11000 and 9000 B.C., and goats were domesticated shortly after. These animals were used for meat, milk, and fur. Bands of people at this time were still primarily nomadic. 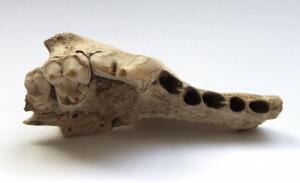 Remains for sheep were first found in the Middle East, where there are high proportions of bones of one year old sheep. 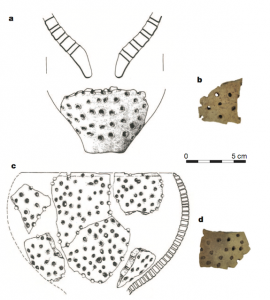 Dating for the domestication of these animals is possible by looking at the remains of those who lived in the area and finding when human beings were able to process lactose. There was an incredible advantage for those who could digest lactose because of high amounts of calories available from milk. 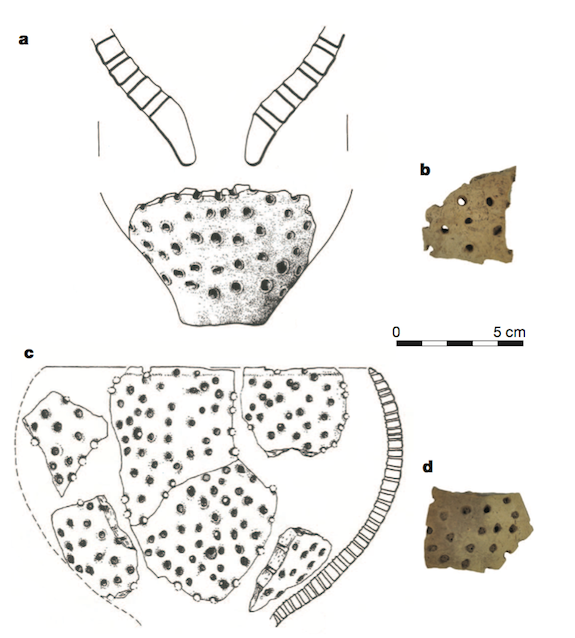 Evidence is also available about milk use through 7000 year old perforated pottery that was used for cheese production. Use of this type of potter was proven by experimental archaeology and chemical analysis of the clay, which found milk fats inside the pottery. Pigs and cattle were domesticated slightly later, around 7000 B.C., but these remains are usually found with societies that were more sedentary. One of the main reasons to domesticate animals is because there is always a constant, readily available, and reliable source of food. If one goes hunting, there are no chances that he or she will return with meat for his or her community. If one hunts too many animals, the food will spoil, and the food will be wasted. Domesticating animals also provided for suitable manure for farming, hides and wool for coats, and bones for tools. Through the domestication of animals, the concept of staying in one place was a viable option for people. The need to constantly move for a steady supply of food was outdated, and we see the rise of civilizations and larger social organizations as animals domestication begins. This entry was posted in Fall 2015 by dasparks. Bookmark the permalink. Who wouldn’t want to hear more about our furry friends? The domestication of dogs provided humans with more than companionship. Dogs helped to consume food waste that would attract other, less friendly, animals. Dogs provided security by responding to intruders and helped provide food through tracking and herding skills. In lean times, dogs would be consumed. Some cultures consumed dogs only during important rituals. Our connection to these furry friends is one with a long and complex past. The domestication of animals did dramatically shift the lifestyle of humans from hunter gatherers to farmers. As groups of people began to settle in areas, populations rose and animals that were initially available for hunting began to scatter. Thus, humans could not readily go back to the nomadic lifestyle even if they wanted to. Therefore, the need to grow their own food was greater and agriculture and animal domestication became primary methods for food production. Dogs and cats have played an intrinsic role in the evolution of the human species, and we have to wonder where would we be without them?